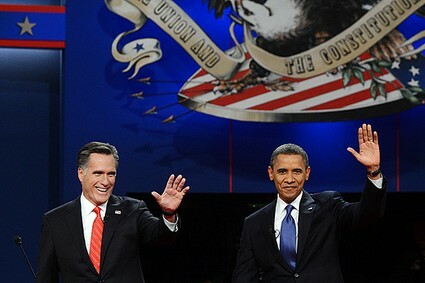 Well, the 2012 presidential contest is almost over. The media have provided a day by day, blow by blow account of each round and if you live in a swing state you might even feel that your vote does really count. With only two contenders you’d think it would be easy to pick the winner. You have a 50-50 chance of getting it right. Maybe the political analysts have you wondering about the women’s vote, the Latino vote and the elderly voters in Florida. But scientific astrology tries to cut through all the guesswork and speculation to determine who will win by a scientific analysis of the contender’s birthcharts. It tries to determine the winner by following the principles established by scientific astrology. Stellar Dynamics — the new astrology — is based on data and data means numbers and precision. But this latest development in the astrology story has one enormous problem — the measurement of the birth time. The calculation of a birthchart and the measurement of its data, including the progression report, are now done by a computer program so the revolution in speed and accuracy leaves more time for investigating and examining the astro-data. The chart on the screen has became a dynamic model of an inner-world astrological environment and now, with the precision provided by computer-age technology, the limits placed on a chart’s accuracy have become increasingly evident. These limits — due to a never quite accurate birth time — primarily apply to the degree and minute on each house cusp and a slight change in the birth time can result in a planet changing its house position. When this occurs there’s a major structural change in the chart. (See Paul Ryan’s chart.) Not only that in The Hermetic System of Astrology the ascendant and Midheaven are progressed, so the accuracy of their birthchart positions is crucial when calculating the start, peak and end dates of their progressed aspects. 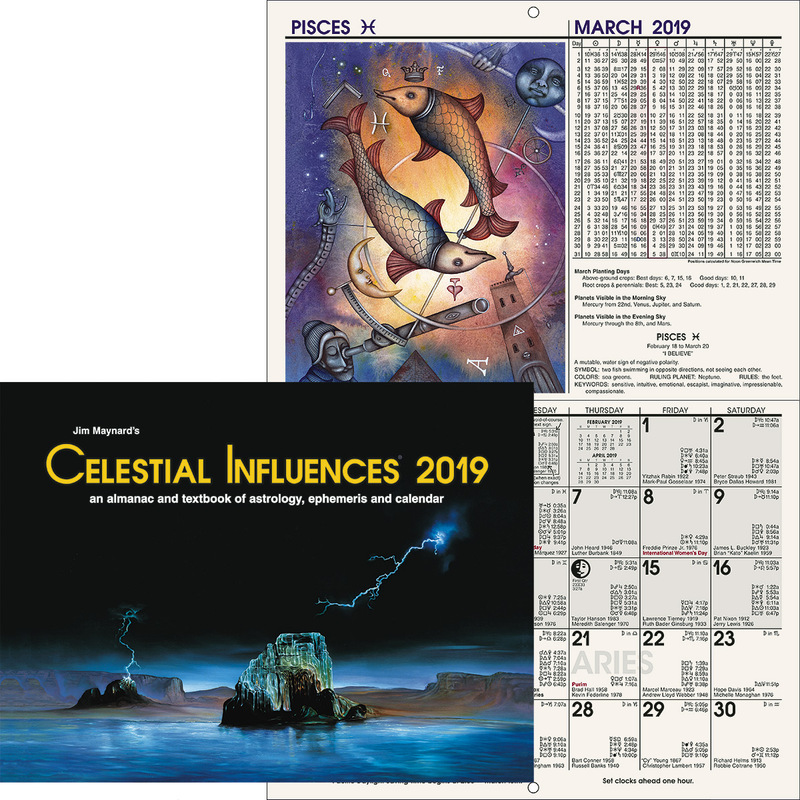 Their aspects — at a particular point in time — have an important influence on the functionality of the chart and the character it maps, but in 2012 Stellar Dynamics is limited by high-level uncertainty in the start, peak and end dates of an ascendant or Midheaven progression. An example of this problem can found in the progressed charts of Barack Obama and Mitt Romney. Based on his recorded birth time Barack Obama on November 6, 2012 has progressed ascendant at 25 Aries 51. It has moved to form a separation (opposition) aspect with progressed Mars (at 25 Libra 43), an obstacle (square) aspect with birthchart Saturn (at 25 Capricorn 19R) and a luck (trine) aspect with birthchart Uranus (at 25 Leo 16). But the chances of him gasping in his first lung full of oxygen at exactly 7.24pm are a thousand to one. His birth time has a plus or minus one minute margin of error so the first breath that started his life journey probably occurred sometime between 7.23 and 7.25pm. The problem regarding the position of his progressed ascendant can be partially solved by calculating its position for these two times. At 7.23pm the progressed ascendant on November 6 is at 25 Aries 32 and at 7.25pm it’s at 26 Aries 10 and this means that within the birth time’s two minute margin of error the progressed ascendant is within orb of the previously mentioned progressed aspects, which is important data for any astrologer who’s prepared to factor these aspects into her prediction. Obama’s ascendant progressions reveal a personal tendency for strife (Mars), loss (Saturn) and unexpected developments (Uranus) and if the ascendant-Mars opposition aspect is in orb it’s having a crucial influence on his bid to retain the Presidency. Mars is co-ruler of house 10 — getting the job. If the ascendant-Mars-Saturn progressed T-square is in effective orb it’s a big liability, although Mars and Saturn do form a trine aspect in the birthchart: And while progressed ascendant is trine birthchart Uranus it’s activating a birthchart opposition mapping a very unpredictable situation. And this is more data for the astrologer to take on board. Progressed aspects release birthchart potential and the only way of measuring a progressed aspect’s potential is to calculate its astrodynes, harmodynes and discordynes. But these won’t be 100% precise because the birth time is never 100% accurate. And based on the birth time Mitt Romney gave his progressed ascendant is at 28 Cancer 02. It has moved to form a luck (trine) aspect with birthchart Moon (at 27 Scorpio 36); an agitation (sesquisquare) aspect with birthchart Mercury (at 13 Pisces 55R); an obstacle (square) aspect with progressed Mars (at 27 Aries 04) and a luck (trine) aspect with birthchart Jupiter (at 27 Scorpio 33). These ascendant progressions reveal a personal tendency for quick adaptation (Moon), restlessness and indecision (Mercury), haste and strife (Mars) and joviality and optimism (Jupiter). 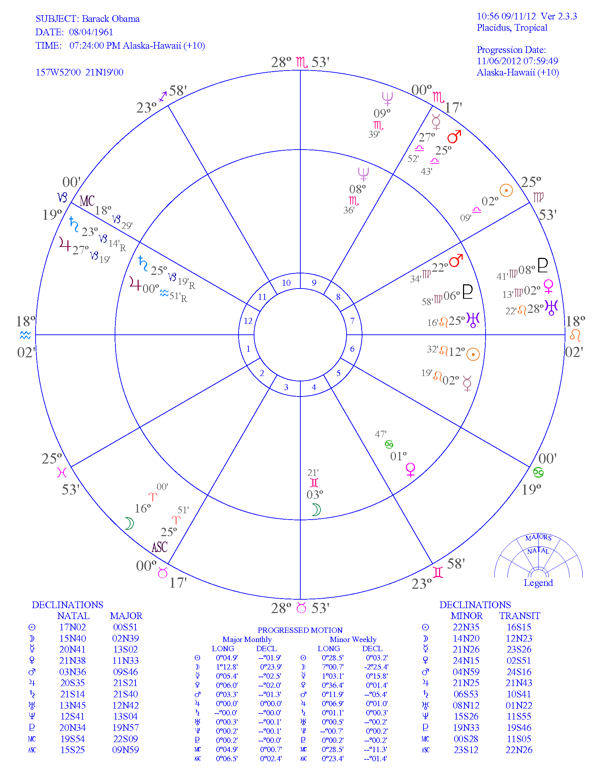 The Moon-Jupiter conjunction in Romney’s chart is an astrological hot-spot and if progressed ascendant is in orb of a trine aspect he has luck on his side, but because everything hinges on an accurate birth time, the astrologer just doesn’t know for certain if these aspects are in orb of influence or not. And this inadequacy impedes the integrity of the astrological assessment. It will be the biggest problem facing astrological science in the foreseeable future. The astrologer does what the meteorologist and doctor do — s/he examines data. And both the meteorologist and the doctor, working with the most sophisticated technology, can get it wrong. The TV weatherman presents and explains data — the high pressure system that’s bringing hot air from the south and the low pressure system that’s bringing cold air from the north — and based on the data and knowledge based on previous research, s/he makes a prediction regarding tomorrow’s weather. Yet, within a 24 hour time-frame, some unexpected event can alter the modeling and the weather that occurs. All the available data has been carefully analyzed and assessed but Uranus — the unexpected element — has disrupted the prediction process. And a doctor analyzing all the test data pertaining to a patient’s health can make an incorrect diagnosis and get it wrong too. So meteorologists, doctors and astrologers analyze data and if all the data is analyzed correctly an accurate diagnosis and prediction will be made. If the data is not analyzed correctly or there’s unknown data that’s been neglected there’s a good chance s/he will make a wrong diagnosis and prediction. In the Presidential contest there are two birthchart’s that provide hundreds of bits of data. Each bit has to be assessed and analyzed and the end result is a data-base of information that can be compared. The accuracy of the data depends upon the accuracy of the birth data, particularly the birth time. So charts had to be constructed and progressed. Progressed aspect reports had to be generated and the data provided by each report had to be assessed. So managing the data and making sure it was accurate is very important. It’s time consuming, but computer technology has lightened the work load. And now you’re examining the candidate’s charts trying to find a stand-out marker that due to the exceptional good-fortune it maps indicates that one candidate will be the winner, or a stand-out marker that due to the dire misfortune it maps indicates that one candidate will be the loser. That’s what Elbert Benjamine and The Brotherhood of Light mundane astrology class did so…. …on November 6, 2012 Barack Obama has 2 luck (trine) aspects in his chart — progressed Saturn trine Mars and progressed ascendant trine Uranus — and Mitt Romney has 4 — progressed ascendant trine birthchart Moon, progressed ascendant trine birthchart Jupiter and progressed MC trine birthchart and progressed Pluto. But Obama’s ascendant-Uranus trine and all Romney’s trine aspects activate birthchart oppositions so they’re not as good as they look. And they all depend on an accurate birth time. So if you place a question mark over any trine aspect formed by the ascendant or Midheaven the only zodiacal trine aspect is progressed Saturn trine birthchart Mars in Obama’s chart and it’s as good as it looks because it’s activating a birthchart trine. 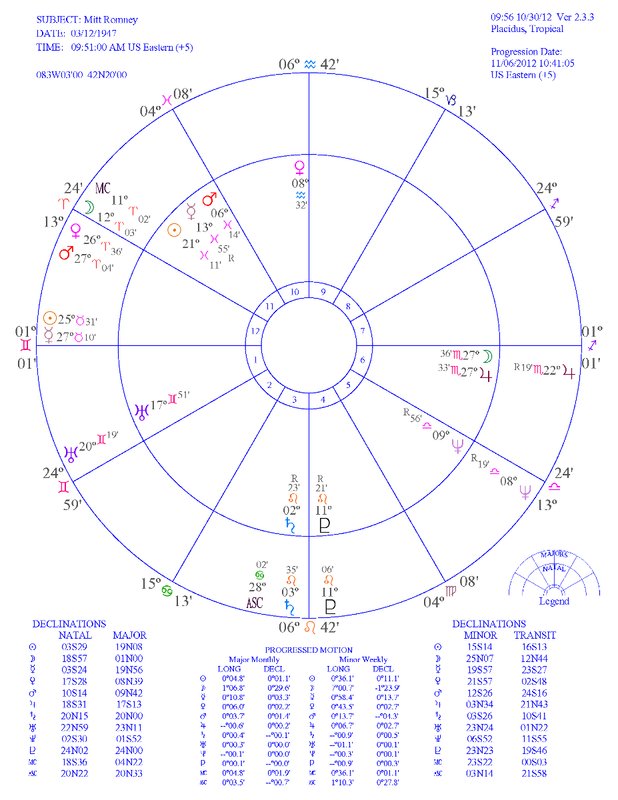 And it’s interesting to note that Barack Obama and the United States both have a Moon-Mars-Saturn grand trine in their charts. But all things considered neither candidate has a winning edge due to an outstanding high-harmony marker in his progressed chart. As for discord Barack Obama has one separation (opposition) aspect. That’s progressed ascendant opposition Mars and that brings the birth time and ascendant degree back into the equation. And he has four obstacle (square) aspects. Progressed Sun is square birthchart Venus; progressed Mercury is square progressed Jupiter; progressed ascendant is square birthchart Saturn; and progressed Uranus is square birthchart MC. And the ascendant-MC squares are dependent on an accurate birth time. Mitt Romney has two separation (opposition) aspects. Progressed Mercury is opposition birthchart Moon and birthchart Jupiter. And he has two obstacle (square) aspects. Progressed Uranus square birthchart Sun and progressed ascendant square progressed Mars. So both candidates have progressed discord adversely influencing their chances of winning the election. And in the past astrologers have successfully picked the winning candidate based on the astrological data provided by his progressed chart. Obtain the birthcharts of the contenders and their running mates. Progress their charts to the date of the election. Calculate the progressed tenth house harmodynes and discordynes for each chart and the contender with the most tenth house harmodynes — of the least tenth house discordynes — was judged to be the winner. In 1948 the assessment process did not involve a horary chart, aspects in the Jupiter and Saturn cycle charts or the New Moon chart. The winner was judged to be the candidate with the most tenth house harmony — that was the crucial data — and Elbert Benjamine got it right. Harry S Truman had the most tenth house harmodynes. But this is only a one-off sample so whether the theory — that the candidate with the most tenth house harmony will be the winner — stands up in a larger sample must be tested. We just don’t know if in a large sample of charts if the winning candidate will have the most harmonious tenth house. And until this is done we won’t know if feelings, guesses or unconscious impressions are interfering with the science or if astrology can actually predict the winner. But the point is that gauging elections is an evolving dynamic. It doesn’t stand still and when new procedures give better results they should be adopted and when old procedures are found to be unreliable they should be discarded. The objective is to find a procedure that has a success outcome whenever it is used to gauge the winner of a political contest. So in the age of measurement when knowledge must be based on numbers and statistical analysis the only sure way of determining the winner of a political contest is to calculate the astrodynes, harmodynes and discordynes of each candidate’s tenth house. But the numerical values provided by the astrodynes are very precise and can only be relied upon when the birth time has been accurately noted and recorded: And since 1948 (when the birth times used by Elbert Benjamine weren’t documented) there have only been three Presidential elections where both candidates had recorded birth times. They were Gerald Ford Vs Jimmy Carter in 1976; Al Gore Vs George W Bush in 2000; and John McCain Vs Barack Obama in 2008. So there’s a shortage of samples. There’s also the problem of doing the progressed astrodyne calculations. They’re time consuming rather than difficult but if they’re done on an imprecise birth time the end result is meaningless. So in the Obama-Romney contest they have not been done because Romney’s birth time is not documented. There is a computer program available that does the calculations but it has faults that make the numbers unreliable. 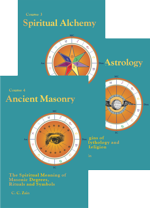 Scientific evidence-based astrology — the new science of data astrology — is an emerging phenomenon. But it’s very new and in a presidential contest data has to be compared and there’s very little evidence-based research to guide the process. So in 2012 we’re making comparisons between sets of data using birthchart astrodynes. We’re using data provided by progressed aspects and we’re using data provided by previous astrological research to refine the data management. But we’re assessing and comparing uncertain data, simply because one of the charts has an uncertain birth time. And if Elbert Benjamine got it right all we really need to do is calculate each candidate’s tenth house data on election-day. On election night commentators will be observing graphics and as the votes get counted data will be analyzed. Exit polls will be examined. But the astrologer’s attention is focused on Barack Obama’s and Mitt Romney’s progressed charts. 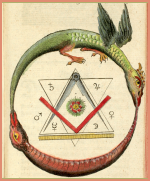 They provide the graphics that the astrologer observes and analyzes and each progressed aspect is an individual graphic. And by far the most interesting graphics to watch will be the opposition aspects formed by progressed Mercury to birthchart Moon and birthchart Jupiter in Mitt Romney’s progressed chart. What’s interesting is that on November 6 progressed Moon (at 12 Aries 03) in house 11 has moved to form a friction (semisquare) aspect with progressed Mercury (at 27 Taurus 10); and agitation (sesquisquare) aspects with birthchart Moon and birthchart Jupiter. The Mercury oppositions are only two months away from their peak power and discord dates and this stimulation by the major progressed Moon will step-up the latent unconscious thought-cell activity indicating a time when it will have sufficient extra-physical power to demonstrate important events. The Mercury-Moon opposition is particularly discordant, but neither aspect directly impacts on the tenth house. They can rightly be classified as discordant rallying forces but it’s their influence on Romney’s presidential bid that has the astrologer intrigued.